A lot of you have been patiently waiting for me to put together this post on my Top Reads from this Past Year! 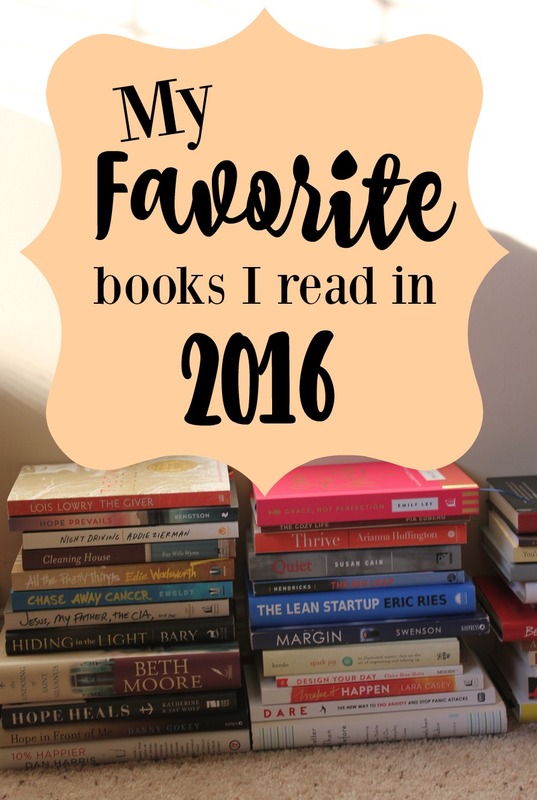 Last year’s post on my Top 10 Reads from 2015 was one of my most popular posts. So I don’t want to keep you waiting any longer! I find it interesting that people are so interested in what I read. But then I remember that I LOVE these types of posts on other people’s blogs, so it’s no wonder! Avid readers are always looking for new great book recommendations, aren’t we? Part of me feels like I can’t really classify myself as an “avid reader” — if you just take this last year into account. You see, I read — which is about half the number of books I’ve averaged over the past 4 years. This includes 5 chapter books I read aloud to the kids + 4 books I listened to on audio. Many of you have wondered where my book posts have been and have asked me to please write more about what I’ve been reading. The truth is: I didn’t read as much in 2016 nor did I set any reading goals because I let myself have a lot more time to rest, feel, think, process, sleep, and just slowly go through one or two books at time. I also left a lot of time in my schedule this past year for quiet. Not only because I knew my brain needed a break, but also because I wanted to see what that felt like! I’m usually a person who always wants to fill up the nooks and crannies of my life with good podcasts or good books so that I can always be learning new things, stretching my mind, and challenging myself. But this past year, I learned that some quiet in my day was good for my soul and helped me to really be able to think and work through some hurts and things in my past that I’d stuffed down deep and ultimately be able to live a much more whole and healed life. This book changed my life this year. And it’s one of the reasons I’m having a Year of Yes! 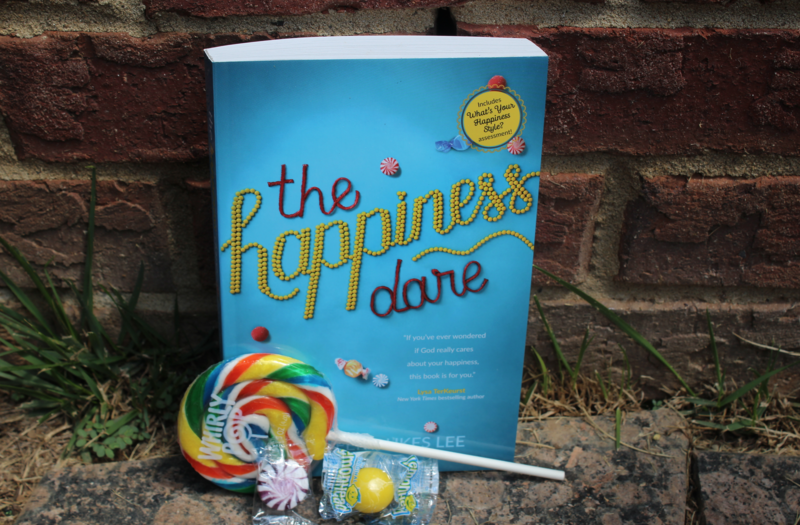 I loved Jennifer’s encouragement to start looking for shots of happy in the middle of the mundane, cultivating cheer in the midst of the messes, and celebrating the gifts and wonder and beauty to be found all around us! As Jennifer challenges us, let’s “refuse to join the chorus of negativity, stop sleepwalking through life, boycott cynicism, and wring the joy out of ordinary days.” We were made for more! We can stop trying to be someone we’re not. Happiness begins in that moment, when we look within and say, “I was not created to be her; I was created to be me”. Happiness is an inside job. You don’t find happiness by being the best version of someone else; you find happiness by being the best version of you. As I’ve been , I’m realizing that there are so many beautiful things all around us, but often, I’ve been too busy and focused on productivity that I’ve missed them. This dare has really challenged me to look around my world and find the happy. To add more shots of joy into my every day life. To wring the delight out of what might seem ordinary. Read more of my thoughts on this book here and here. This book wasn’t anything like I expected it to be, but it was everything that I needed to read. It was so good and messed with me in such a profound way! Bonnie shares how she had to go back to the broken places in her life and work through and heal those before she could find freedom from her intense anxiety and panic attacks. As someone who has experienced anxiety since the time I was a young child, I resonated with her journey so much and this book was a big piece of my own healing journey this year. If you feel like you’re running on empty with no time for rest, no time for yourself, and no time for God, I think you’ll be blessed and challenged by this book. This book is one I savored slowly and . This book resonated with me at such a deep level. If you are struggling to get off the exhausting hamster wheel of life, if you feel like life is beyond crazy but you can’t figure out how to slow it down, or if you just wonder what it would be like to not live life at breakneck speed, I highly recommend this book. I slowly savored it like a cool, refreshing drink of water and have re-read so many parts of it because it’s been such a balm to my soul! I’d had this book on our shelf for a long time, but honestly, the cover just looked boring so I didn’t pick it up to start reading to the kids. I’m glad it was assigned reading in our Sonlight homeschool curriculum last year, or we would have missed out on this gem of a book. Yet another great example of why you shouldn’t judge a book by its cover! All three of the kids found it very engaging and attentively listened when I read it and always begged me to read more when I’m done. 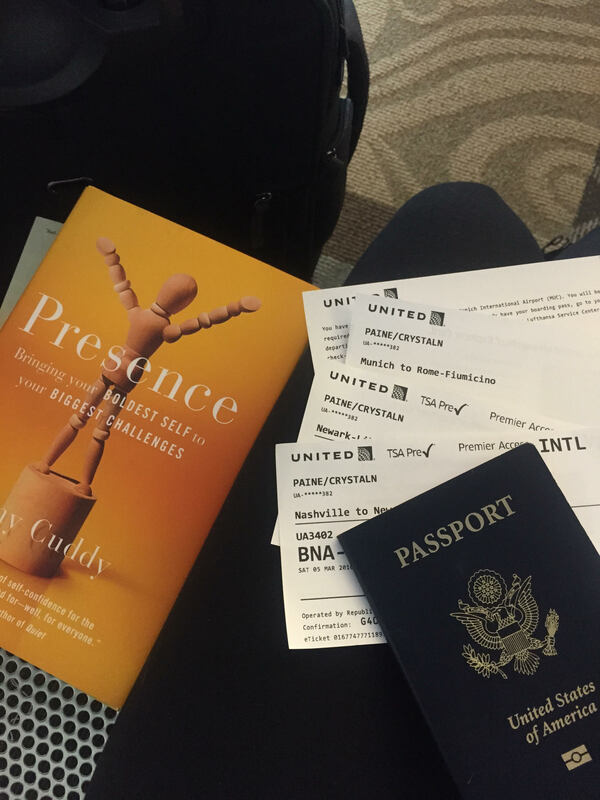 Before I left for my trip to Israel and Italy, I had ordered the book, , by Amy Cuddy. I’m not even sure where I heard about this book, but it was the best thing I could have read on the plane. There was so much in the book that really challenged me. The thing she said that impacted me to the core was about the “impostor syndrome”. She explained this is a complex we develop when we go into situations where we feel that we are an impostor. Like we’re the only one who doesn’t really belong and if other people found out how scared or unqualified we felt, they would find out we were just an impostor. This really hit me hard, because I had felt exactly like that going into the trip (and in many, many, many other instances in my life!). A few days before we left for the trip, we were given the bios of all of the people who would be on the trip. The group was made up of some amazing individuals who had done incredible things with their life. They had huge followings, had won major awards, they were well-known, well-qualified, and well-experienced. When I compared myself to the others who were there, I felt like I didn’t belong. But I realized that I probably wasn’t the only one who felt like this going into the trip (and I found out through conversations with some who were there that that was indeed the case!). Every time I would start to tell myself how out of place I was among the group, I would make myself say, “I belong here.” Not in an arrogant way, but as a reminder that I was asked to come on this trip and that, as such, I was not an impostor. I might have less life experience or fewer connections, but I had something to offer and bring to the table. So I would hold my head up high, remember that God had allowed this opportunity for me, and remind myself that I was exactly where I was supposed to be. 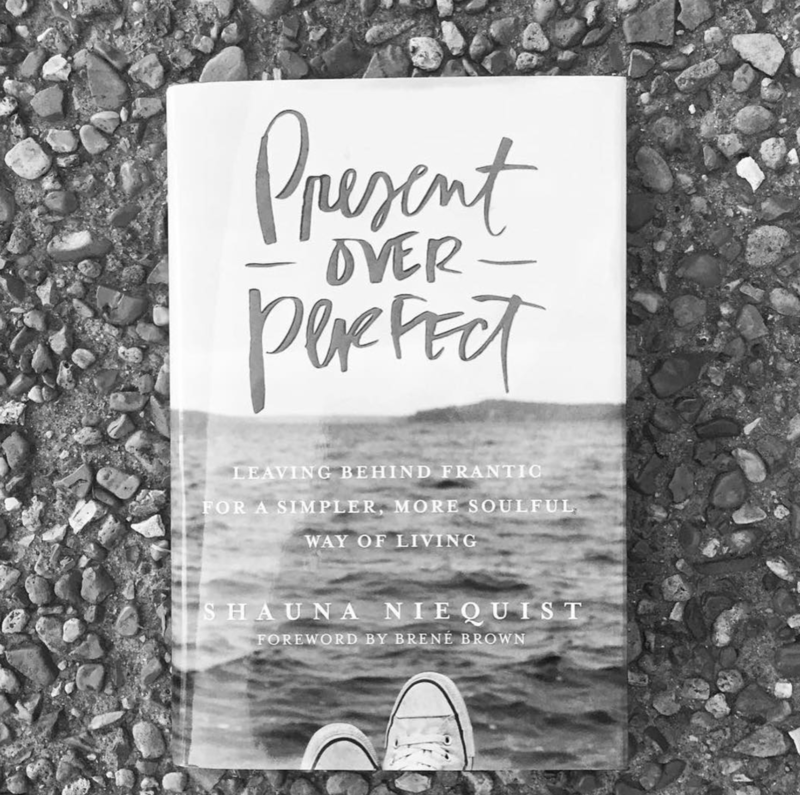 If you struggle with insecurity or feeling like you have something to offer or bring to the table in settings with others, I would highly recommend this book. It’s packed with lots of practical advice — some of which I will carry with me and follow for the rest of my life! Read my post here where I share more about how this book impacted me. This was our second top pick for a read aloud this year. Such a fascinating story that we all enjoyed! I listened to this audiobook and now know why so many people have raved about it! We went to the movie back at the end of 2014 and I’ve wanted to read the book ever since! And the book was definitely every bit as good as the movie. Such a powerful, powerful true story of courage and forgiveness. It’s a L-O-N-G book with a lot of details and information, so I found that listening to it via audio (I got it from the library) was perfect for this type of book! Highly recommended! This. This is the message of the Gospel. This is redemption. This is what Jesus meant when He said, “it is finished” while dying on the Cross. The Gospel is not about what we do, how we measure up, or our good deeds. It is about Jesus and what He has *already done* for us. 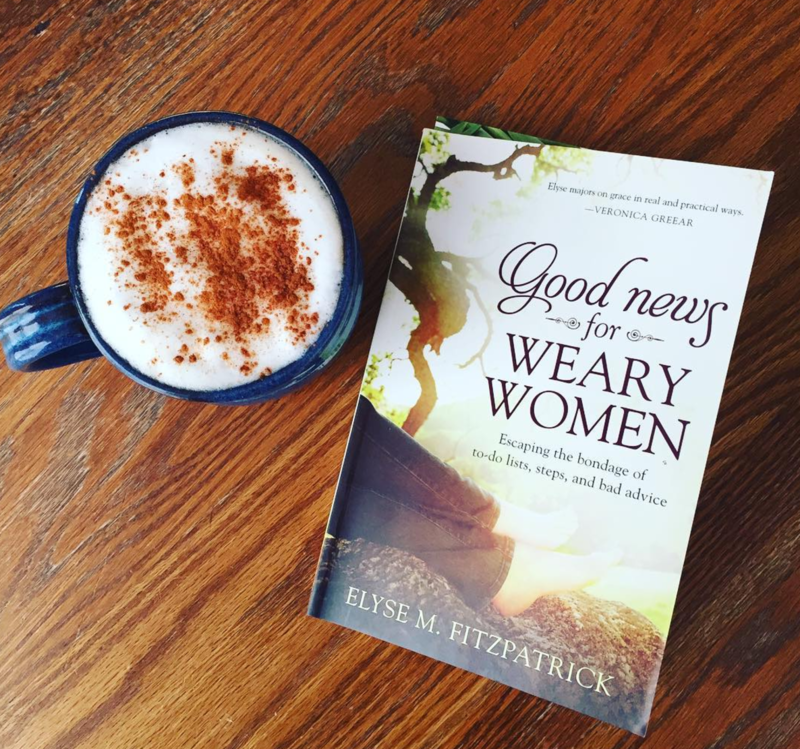 Our one job is to live lives of worship and love to Him, resting in His grace, relying upon His strength, and living in the knowledge that — in Christ — we are loved, we are redeemed, we are beautiful. There is no condemnation in Christ. None. So stop beating yourself up over what you haven’t done or aren’t doing. Start living in the joy, rest, and forgiveness He is freely offering you! As I told you yesterday, one of my goals for 2017 is to read 48 books I already own. 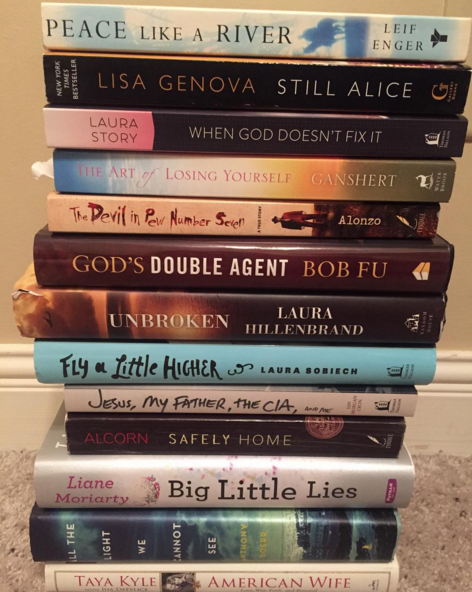 I picked out a stack of 12 books that were old Christian reprints, a stack of 12 books that were story driven, a stack of 12 books that were about improving your life, and a stack of 12 books to encourage me in my Christian walk. My plan is to try to read one from each stack each month. We’ll see how it goes! I’ll be sharing updates on what I’m reading and what I’m planning to read each Sunday in my new Peek Into My Life posts where I’ll be sharing snippets from my life — what I’m reading, watching, listening to, working on, pondering, etc. 🙂 Look for the first post tomorrow! What were your top reads in 2016? Tell us in the comments! Looking for more? 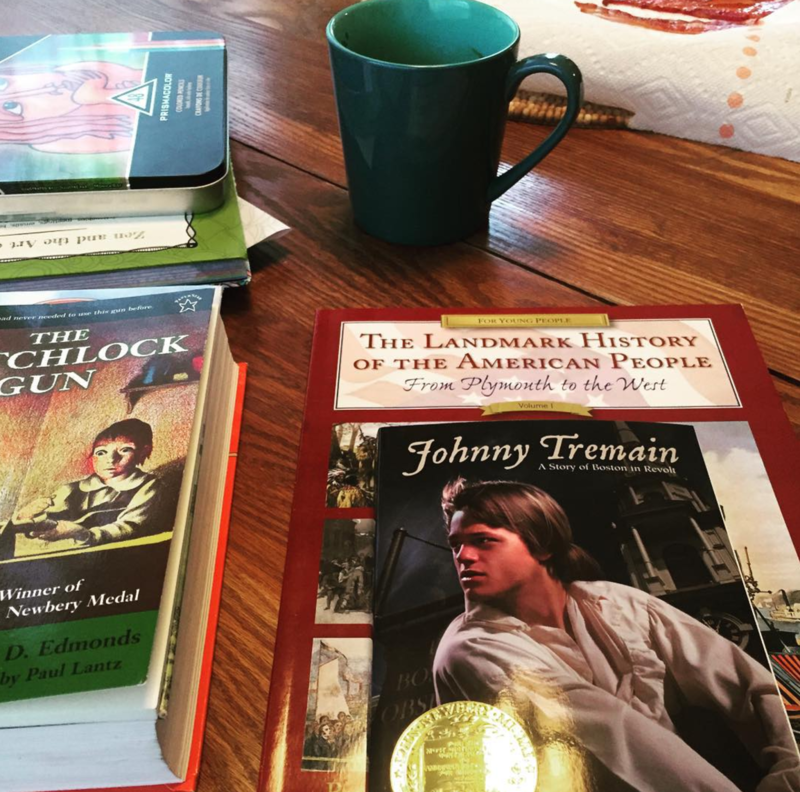 Read more posts about What I'm Reading in 2016. Thank you for sharing this list with us. I’ve read so many good books over the years at your suggestion (and from comments of other readers). I’m looking forward to seeing what others suggest also. I’m reading Love Warrior. Very intense, but good. Happy New Year! I have a lot of the books you have read! My goal is the same: read what I already have!! I’ll have to get a hold of the two read aloud books. Thanks so much for your recommendations and your blog. I appreciate your vulnerability about your battle with anxiety. I’ve had it all my life as well. Keep keepin’ on!!! And please have a blessed and happy 2017!! So the number of books you read makes me feel so much better! I used to call myself a bookworm but read fewer and fewer books when I became a mom! Then, I read 35 or so in 2015, so I set a goal to read 40 in 2016. I fell 10 books short! 🙁 (I blame it on all the sleep I did first trimester, which I don’t regret!) 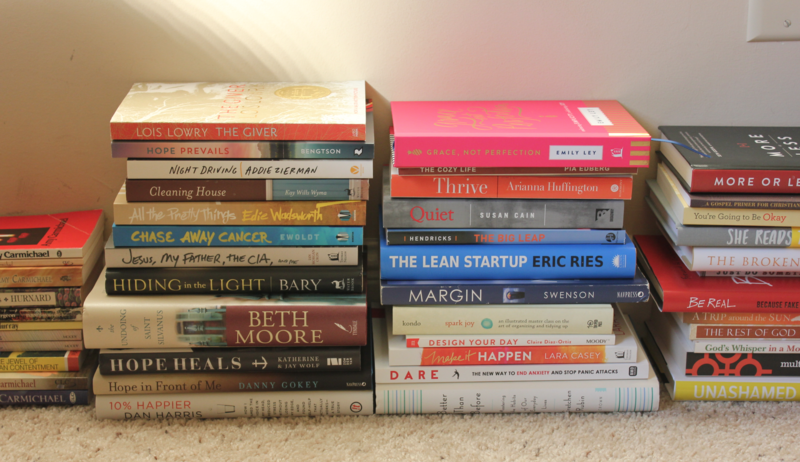 I actually read about 10 books the past few weeks to beef it up to 30! LOL Thanks for sharing! 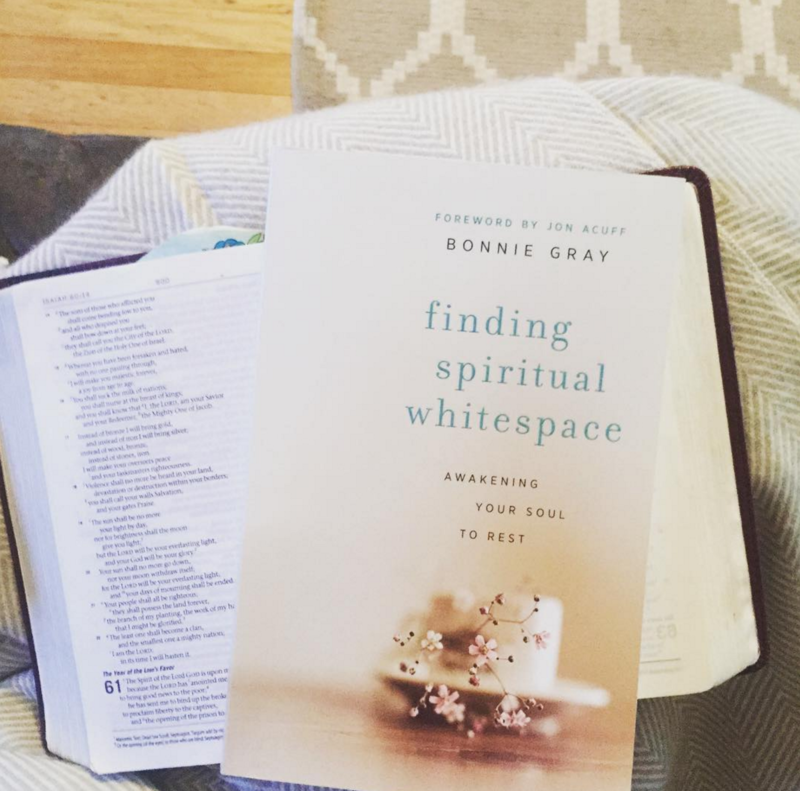 I loved reading Spiritual Whitespace in 2015! Here are my top 19 fiction and 1 non fiction. Unbroken was also on my list of top reads in 2016. In a similar vein, two of my other top picks were The Boys in the Boat and Isaac’s Storm. One book I read and really enjoyed was Boys In The Boat! Nothing I ever thought I would enjoy but was totally drawn into the true story. The Food Babe Way changed how I will eat forever: No more toxic ‘edible food-like products’. Just real food. The Index Card, Financially Fearless, and Rich B**ch were top notch books on personal finance. Most impactful books were When Breath Becomes Air and What Alice Forgot. Most suspenseful book was The Passenger. I loved What Alice Forgot! Thank you for all your transparency and all you share! Just ordered all of your makeover courses to start the year off right including the health one – I’m very excited to see how the Lord will use them in my life! God bless you and yours!!! Thanks for sharing your list. 2016 was the year I returned into reading after a long time absence and I really enjoyed my come back into the reading world. One book that change my life that I read in 2016 is The Life Changing Magic Of Tidying Up By Marie Kondo. I know most you have read this book including you Crystal as you did a review of this book way back in 2015. I also enjoyed reading Rich Dad Poor Dad By Robert Kiyosaki what a great finance book. I am currently reading The Power Of Positive Thinking By Norman Vincent Peale, I am enjoying it. Happy reading everyone in 2017. I loved Unbroken (read in 2015 though) and Presence too. – I listed my favorites in fiction, non-fiction, and memoir. It’s a small list, because one of my goals for the last two years has been “read fewer books with more intention”. I also created a 39-page rule (I was 39 at the time, LOL) – if the book doesn’t grab me by the throat by page 39, I abandon it. Life’s too short! I see More or Less in your stack of books. Is that one you plan to read? That book is still impacting me years after I read it. I wrote my top 10 list of books I read in 2016 on the blog this week. Included were “Crossing Oceans” in fiction (warning read with tissues–but it is worth it I am still thinking about the characters months later) . In non-fiction “How To Talk To Anyone”, the language is a bit out dated and kind of corny in places but it really helped me improve my ability to start conversations and keep them going with new people. My favorite book for 2016 was The Broken Way. I purchased four as Christmas gifts. Thanks for this post and sharing your reviews with us. Have a blessed New Year. Happy New Year, Crystal! After my folks went back to Kansas on Tuesaday (I’m from Salina) it was right back to long days at work. I was looking so forward to this weekend. 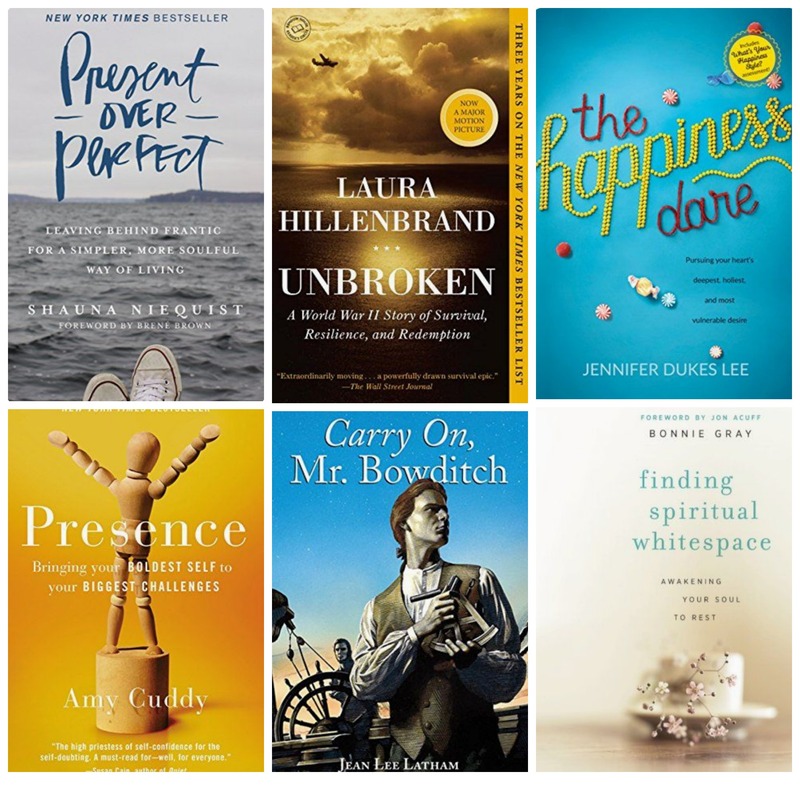 I’m going to rejuvenate, and reading this list of book recommendations has me excited!! First of all, I don’t normally looks at book list recommendations. I don’t know why. Second, my reading time has really taken a back seat to my other love, knitting and crochet. But seeing the Christian selections here makes me want to read all of them. And the children’s books…..when I worked at the library, I couldn’t wait for the new Caldecott, William Allen White or Newberry medal books to come in! In grade school and Jr High, if I wanted to be assured of getting a great read, I sought out those books with the awarded medals. I can’t explain the tingle just seeing those two on your list gives me. Memories. I haven’t read those, but certainly will try. Blessings of the most wonderful kind to you in 2017. I see Quiet in your pile – amazing book. Listening to it has helped me so, so much to know it’s okay to be an introvert. It doesn’t make you weak, it makes you you. Your enjoyment of two older Newbery reads makes me want to suggest the 1962 winner, The Bronze Bow, by Elizabeth George Speare. It is set in Galilee and Jesus is a minor character. Also I am currently reading Choose Joy by Sara Frankl and Mary Carver. Although sad because blogger and writer, Sara, is no longer with us, it is a very touching book about the hardships of life. I love this post! The books you picked as your “top picks” were all wonderful and different. I am an avid reader but I admit that I often find myself in a rut. Nothing really seems appealing or encouraging enough to read. I also love the idea of picking books that you already own for your 2017 challenge. This is such a great idea. I’m reminded of Cameron Diaz’s character in The Holiday when she says, ” I want to read an actual book. For years I buy these books but I never read them” That is SO ME! This year I am going to read books I already own, but haven’t read. Thank you for your truth, honesty, and encouragement. I enjoyed Unbroken and The Boys in the Boat as well. For my kids, we enjoyed Missionary Kid Stories and the National Geographic books for kids (like the book of why, book of how, book about space, etc.) I actually did not keep track of my books read last year and I wish I had. That’s one of my goals for this year. I want to listen to The Boys in the Boat this year. So many people have recommended it! I will admit that I have not read your book, but will look for it. I did just join your Facebook group as I am completely in need of 2017 being a year of happiness and life changes. What are your list for devotional readings/bible studies? 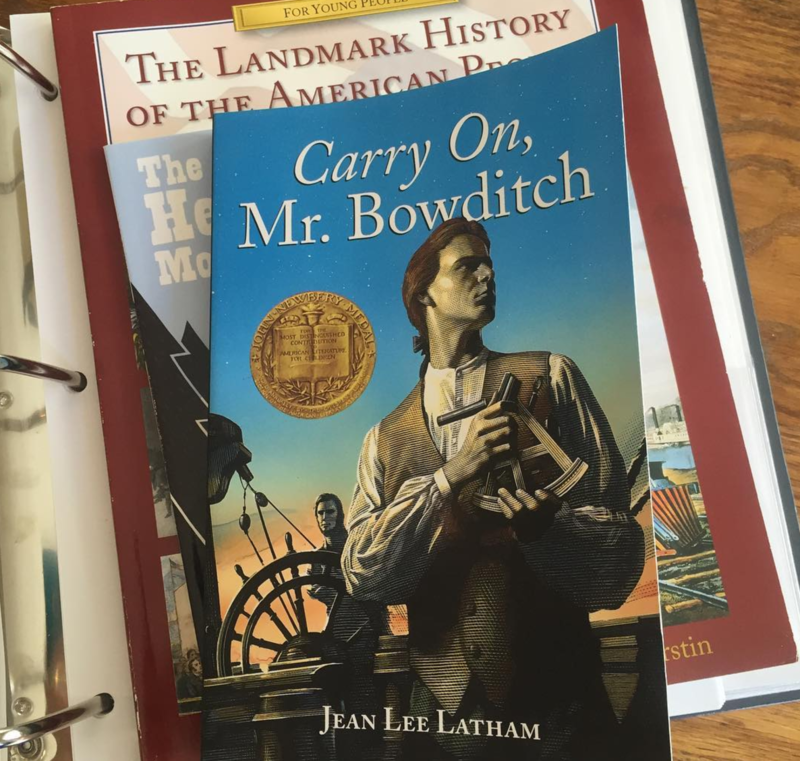 I’ve gotten 3 kids to check out and read Mr Bowditch from our school library after reading your recommendation earlier in the year! All 3 have recommended it to friends so I may have to purchase another copy! One of my favorite books from 2016 was The Immortal Life of Henrietta Lacks. I couldn’t put it down and now it is being made into an HBO movie. I read Unbroken back in 2012.I brought it with me on vacation and had to pay a late fine since it could not be renewed due to long waiting list.Oops. I thought The Immortal Life of Henrietta Lacks was fascinating! I recommend any of Charles Martin’s books. I have shared his books with all of my reading friends.